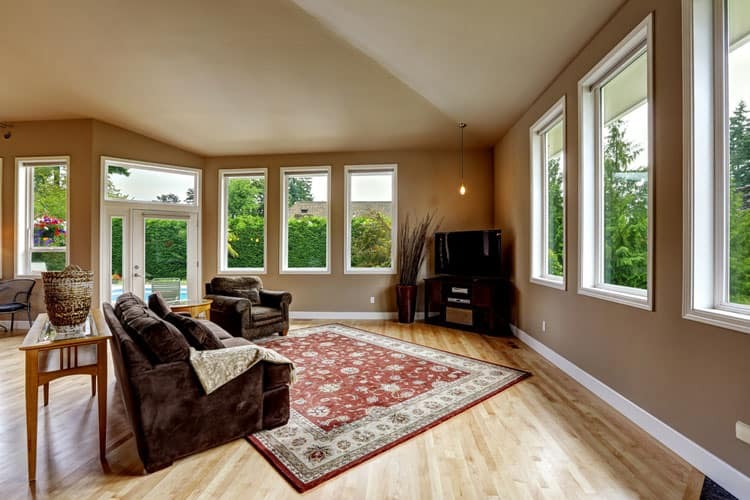 Hardwood floors and living rooms are a classic combination. The two go together like chocolate and peanut butter. 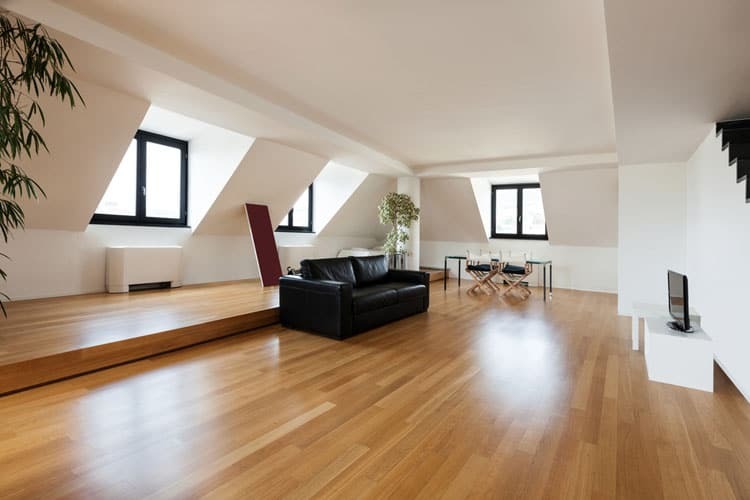 Homeowners should embrace the versatile of hardwood floors. A hardwood floor flecked with patina add primitive appeal to a rustic or country living room while one with a smooth, glossy finish lends elegance to the most sophisticated living room. Move over carpet, hardwood is ready to take the floor. 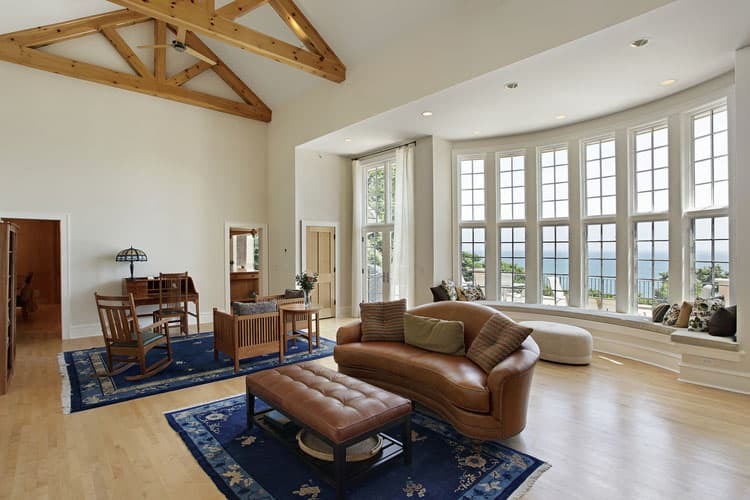 Embrace this room’s two distinct, and beautiful, features: the large windows which allow natural light to highlight the room’s shiny hardwood floors. The homeowners were wise to furnish this room sparsely for any other furnishings would only detract from the beautiful floor. 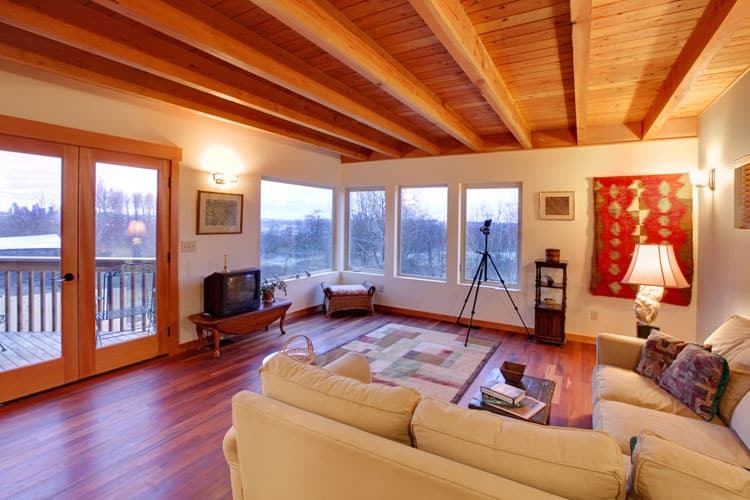 Rich, dark woods abound in this tastefully appointed home. 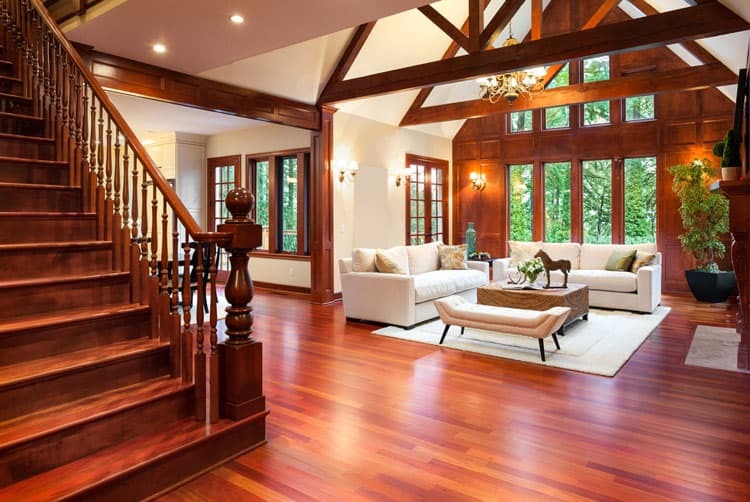 The use of the same dark wood for the floors, stairs, accent wall and ceiling trusses create a space that is both regal and comfortable. The use of cream-colored furniture to match the painted walls creates balance and allows the wood floors to shine. 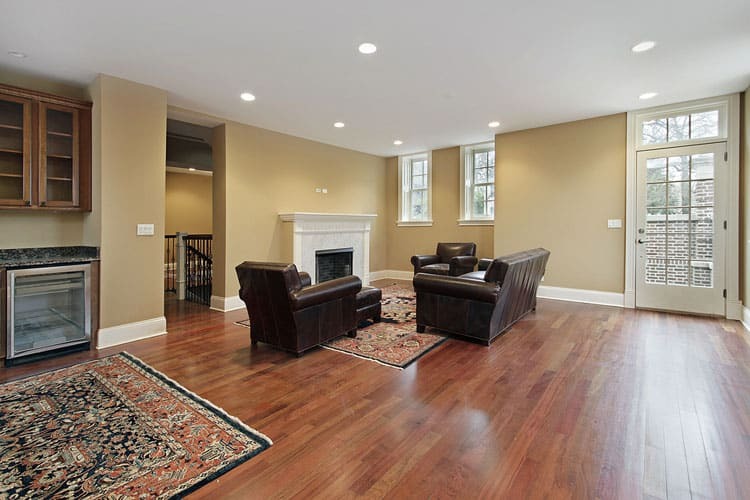 Natural hardwood floors lend a sophisticated, yet easy to maintain, look to this family room. The matching leather furniture create a cozy seating area while the two matching rugs add warmth underfoot and tie the room together nicely. The use of natural elements make this room sing. The fireplace surround made of neutral-hued river rock is a beautiful accompaniment to the rich browns of the hardwood floor. The white built-in and the tan furnishings balance the room. 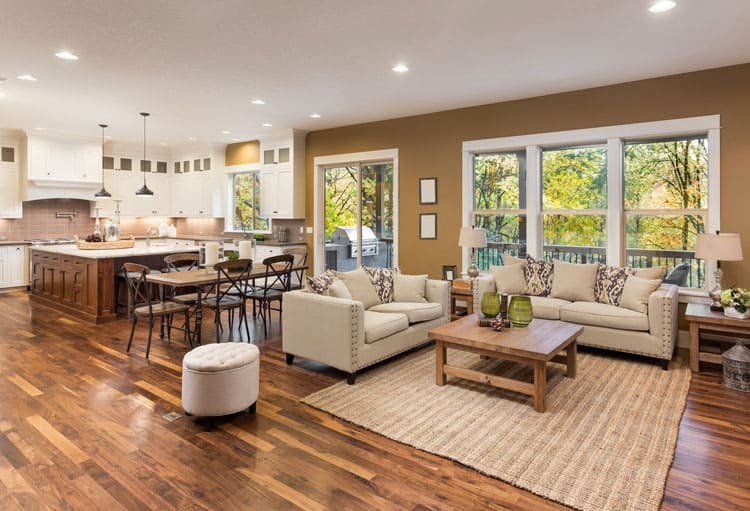 Tones of green, brown and yellow keep this sun-filled living space feeling cheerful. The plaid cushions and arm rests upgrade the wicker furniture from casual to chic. 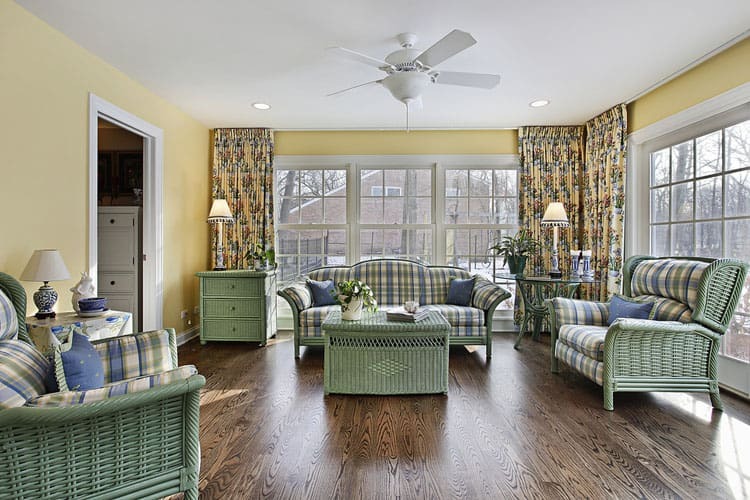 The patterned curtains lend a hint of sophistication and the hardwood floors keep the room from feeling too stuffy. This room is a feast for the eyes. The curved windows with the gorgeous view, the Mission-style furniture, the subtle details of the ceiling beams and, finally, the blond wood floors. This room offers so much without being overwhelming. 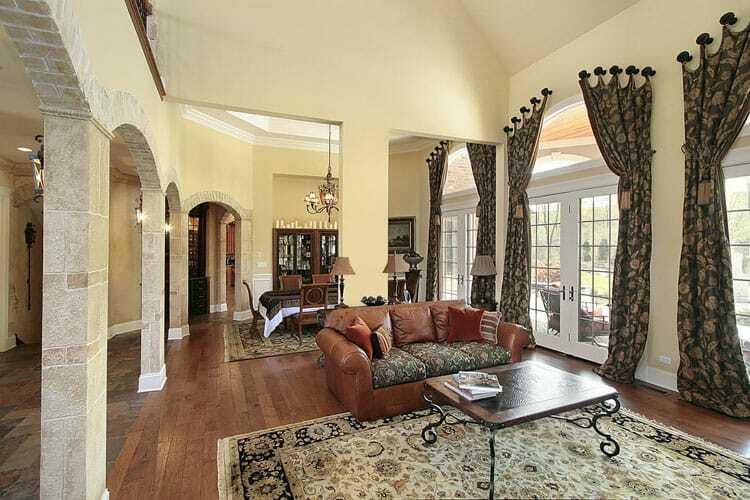 Elegance abounds in this open-concept living room and dining room. The neighboring hallway’s flagstone floor blends seamlessly with the natural hardwood floors of the living and dining space. 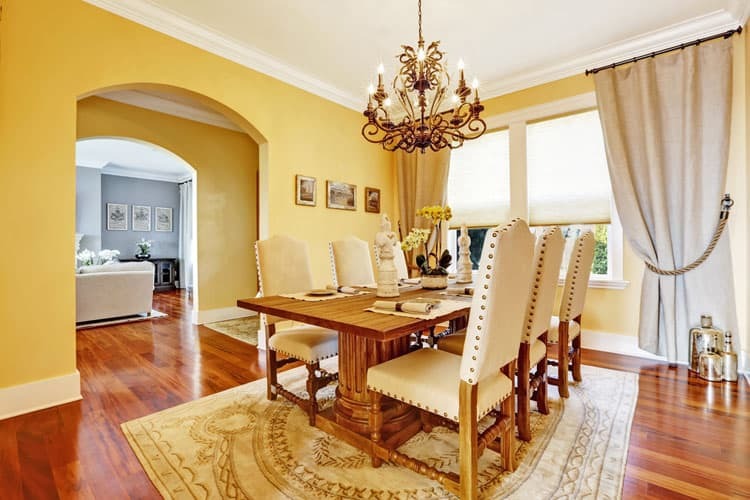 Light yellow walls lend a sense of cheer to an otherwise formal space. The blond hardwood floors ground this modern, airy space. 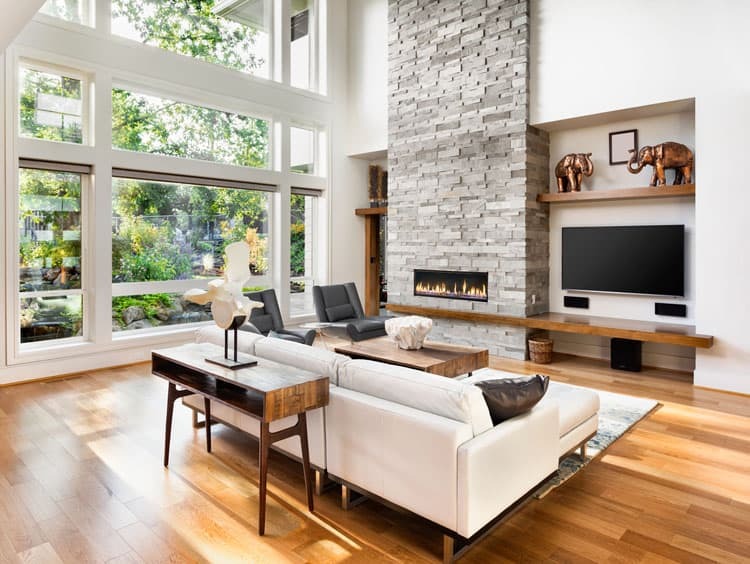 White walls paired with white furnishings keep the space feeling light and clean while the massive stone fireplace is one of the stars of the room. The other two stars, the windows and floors, complement each other nicely. 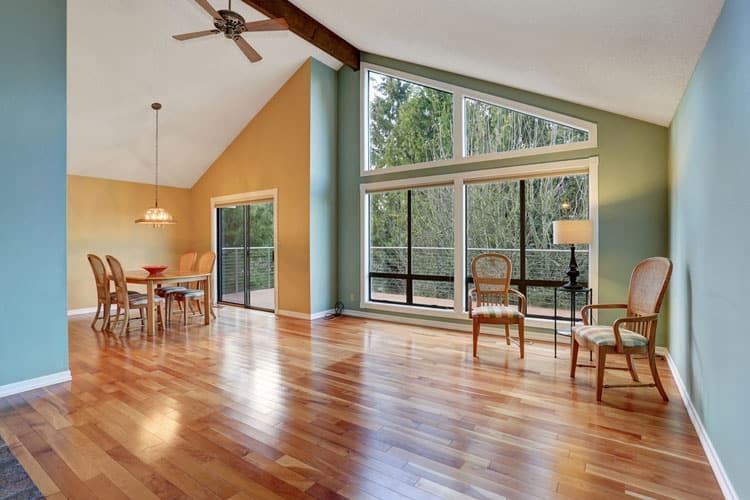 The hardwood floors change color as they catch the light let in by the large floor-to-ceiling windows. This formal living room isn’t what it seems. 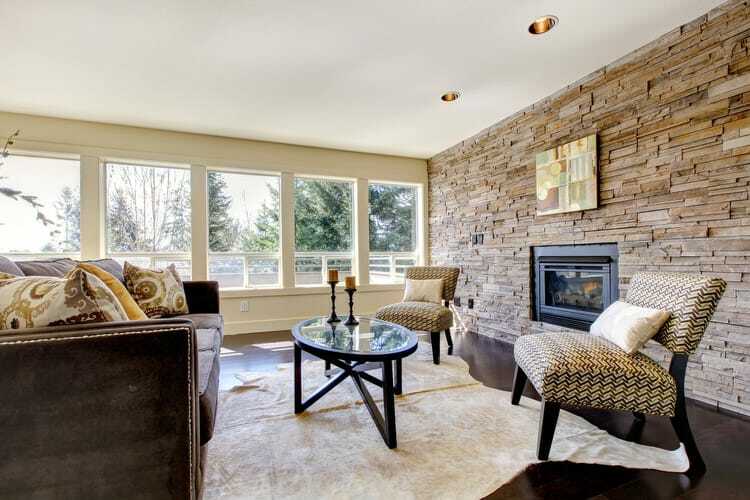 The beige stone surround of the fireplace complements the room’s other beige elements; the walls, window treatments and some furniture. 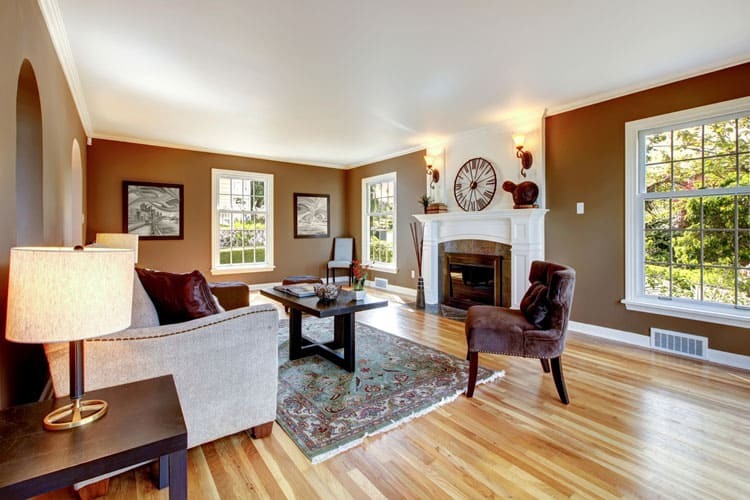 However, it’s the rich, brown hardwood floor that adds color where it’s needed. The black chairs and black floor lamps lend a pop of unexpected color. Open-concept rooms can be a challenge to furnish and decorate, but this space does it beautifully. The homeowners used gleaming hardwood floors for the kitchen and dining room and use a dark tan carpet for the adjoining living room. A simple color palette of beige and cream throughout the entire shared space achieves continuity. Behold the formal features of this living room. The coffered ceiling and shining hardwood floors make this the ideal space for a cocktail party or other affair. Thank goodness for the large, corner window seat because traditional chairs and other seating options are few and far between. However, who would want to cover this floor with furniture? This living room makes a powerful design punch with very little effort. 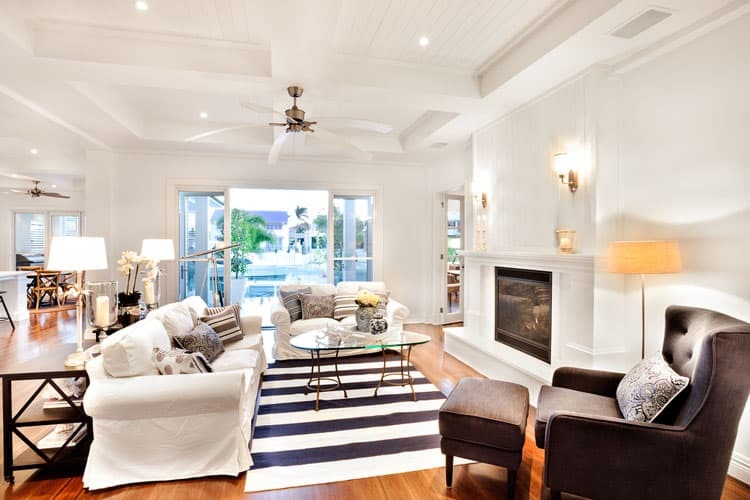 Gleaming hardwood floors paired with classic furnishings create an upscale space ideal for entertaining or relaxing. The artwork on the wall adds a pop of color and visual interest. 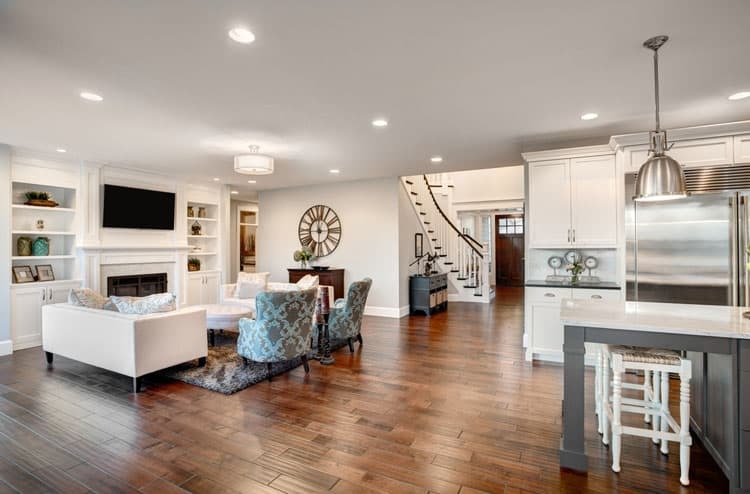 A central hallway is a common feature in most homes, but decorating rooms that are connected yet separate can be difficult. 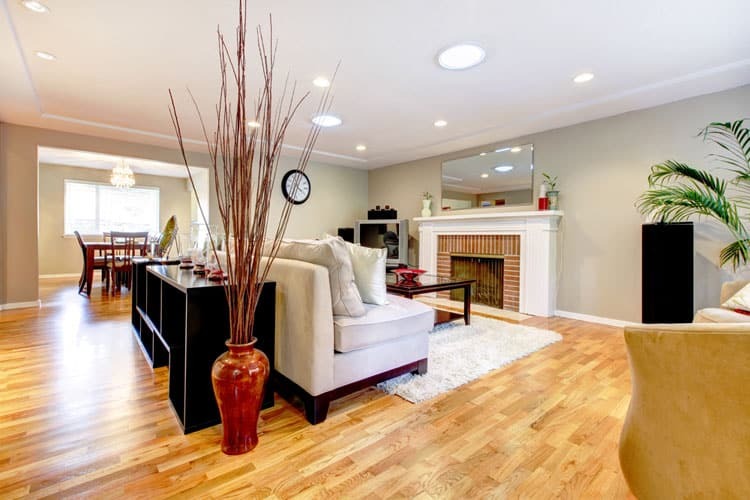 Create continuity by using the same hardwood flooring throughout the entire first floor. A complementary color palette also creates an uniform look. Notice how the cream colored dining room chairs reflect and complement the cream-colored sofa visible in the living room across the hall. This family room has it all. Honey-colored wood floors reflect the ample sunlight from the many windows and the vaulted ceiling makes you feel like you’re living in a tree house. Hardwood floors make for easy clean-up, should anyone come in without drying off after his dip in the pool. Enjoy this room’s sweet serenity. 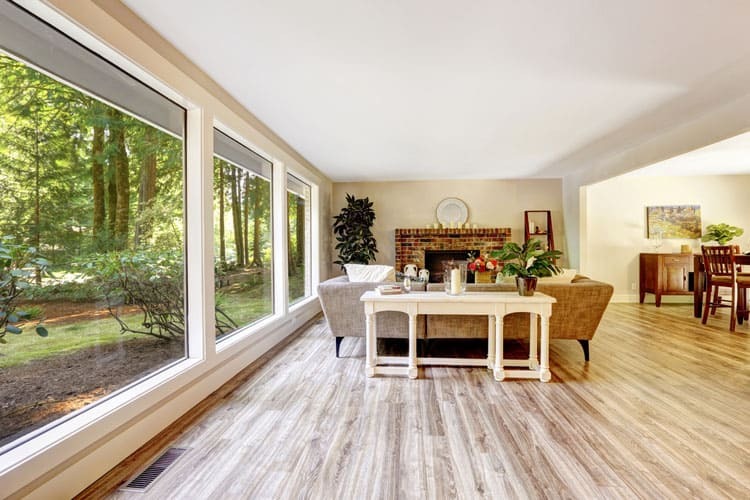 The many tones of the hardwood floor balance the golden hues of the wood ceiling while the curtain-less windows offer unobstructed views of outside. Colorful artwork complete the space without overwhelming it. This room proves that rustic and elegant can work together. 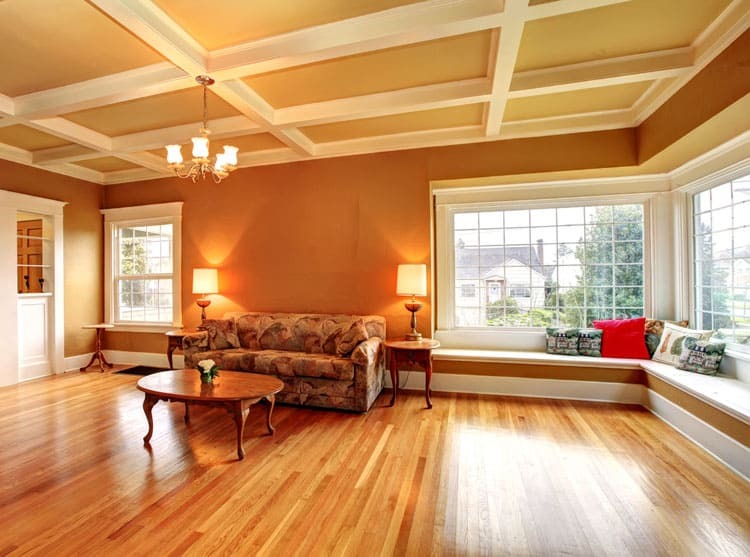 The wide plank of the hardwood floors lend a subtle rustic touch that balances the elegant coffered ceiling. The overstuffed couches provide comfortable seating for a movie marathon while the dining set in the corner is the ideal spot for a game of cards. No room can ever have too much wood. 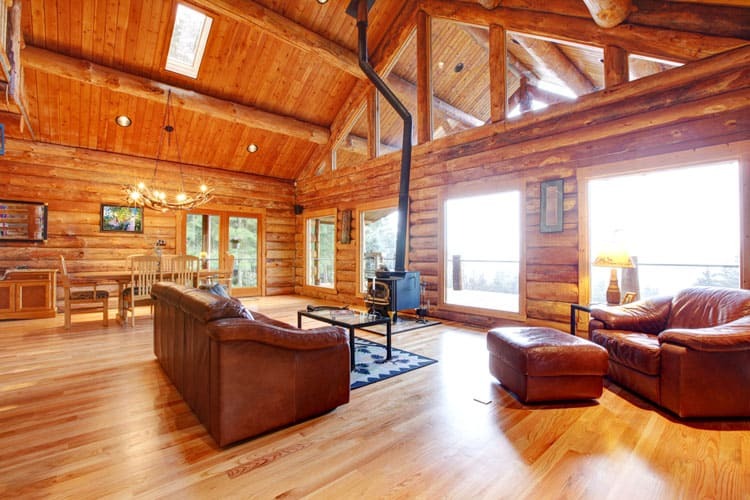 The polished hardwood floors are the perfect companion to the rough hewn walls of this log cabin. Natural touches abound in the space, from the leather couch to the chandelier crafted out of antlers. Anyone, hunter or not, would be happy here. This is luxurious design cohesion at its finest. The dark wood, used for the beams and the kitchen cabinets, grounds the otherwise airy space while the honey-hued wood floors lend a warm sophistication. However, no one can deny that the true star of the room is the marble-clad kitchen island. More proof that hardwood floors work with any decorating scheme, even this relaxed space with bohemian accents. The plush sectional, with its eclectic mix of throw pillows, offers welcome respite after a long day. The bold gold-frame mirror pairs nicely with the honey hues of the hardwood floors. 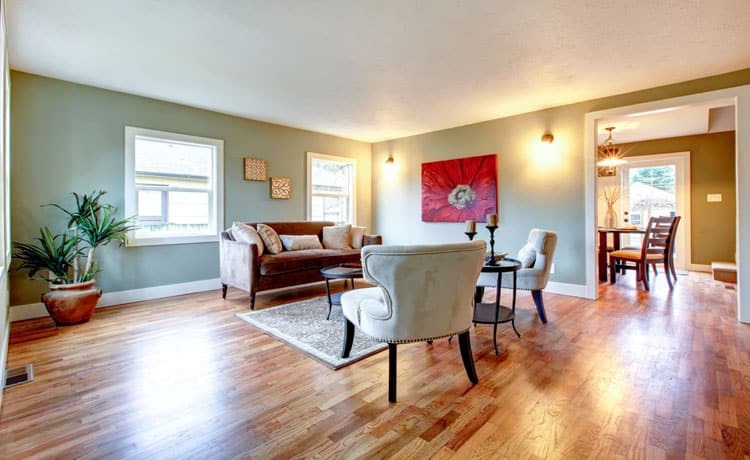 What family wouldn’t want to make this space their own? The ample natural light paired with the views of the trees make this space ideal for a lazy day at home. 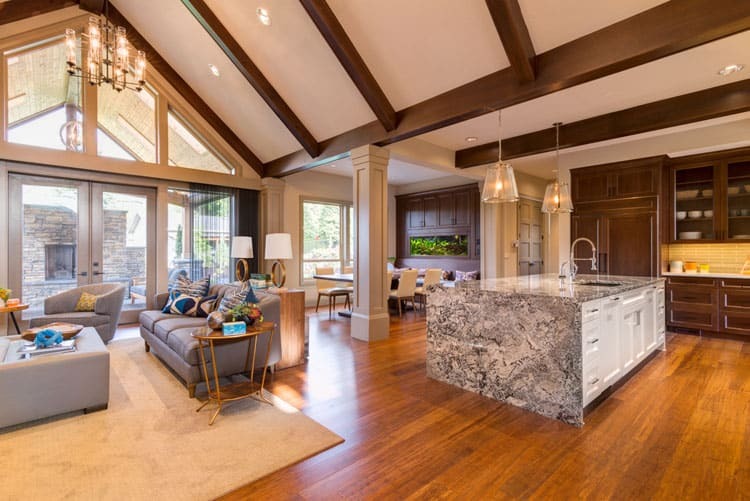 However, it’s the combination of the shiny hardwood floors and wooden ceiling beam that make this suitable for parties as well. Black and white come together to make this room stand out. The black window frames pop when paired with the stark white walls and the simple furnishings make the room feel open and airy. 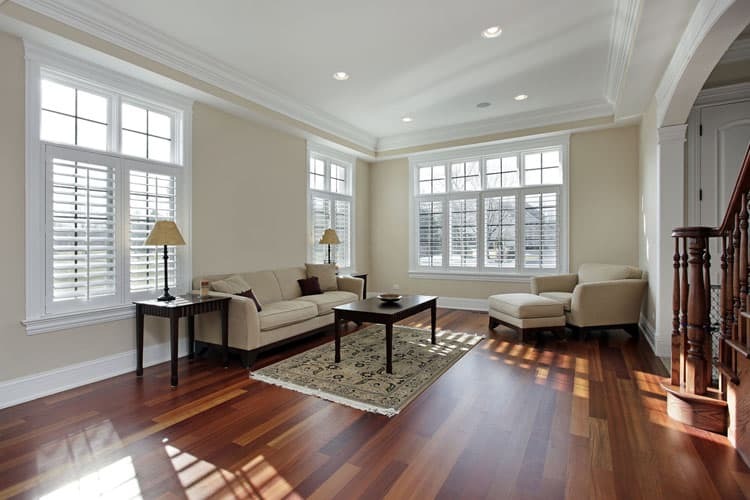 The gleaming hardwood floors keep the room feeling comfortable and homey. This room proves that when you pair natural design elements, you win. 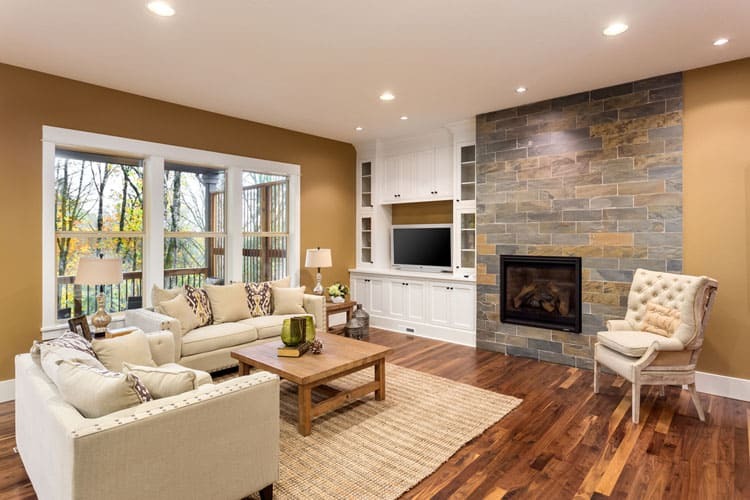 The dark, rich hues of the hardwood floor are the ideal complement to the large stone wall that acts as both a fireplace surround and accent wall. Simple furnishings in shades of tan and chestnut make this room sing. Behold the ideal entertaining space for any family. The open concept living and dining space pair beautifully with the tastefully appointed kitchen. White kitchen cabinets and beige furnishings keep the space from feeling dark. The many hues of the hardwood floor are reflected seamlessly in the kitchen island, dining table set and living room tables. Imagine the holiday get-togethers you could have in this space. The dining room that opens onto the living room offers ample places for seating, plus the furniture color choices beautifully reflect the hardwood floors. The console table is the ideal spot to set up a bar or holiday buffet. 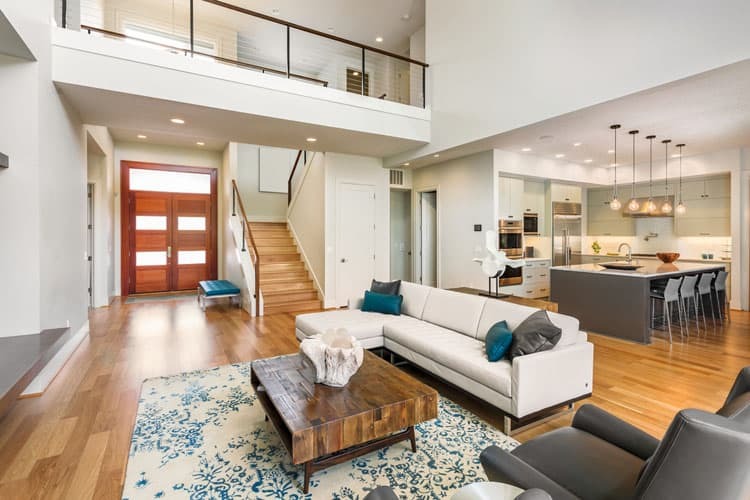 Another room that proves that hardwood floors are the ideal choice for open-concept spaces. This floor unites the hallway, living space and kitchen seamlessly. The white and gray color scheme offers understated sophistication. Behold the intricacies of the grains of this hardwood floor. Various shades of brown play against each other to create a floor that captures your attention. The homeowners were wise not to cover the floor with rugs or the large windows with curtains. This room’s hardwood floor is, truly, the cherry on top. 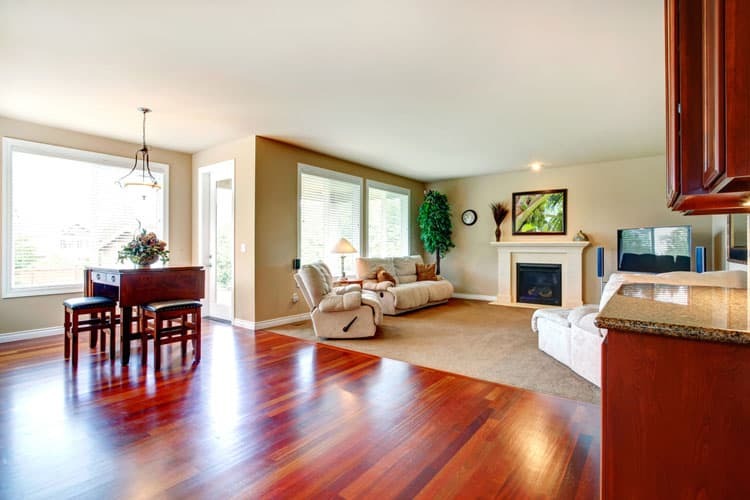 Rich, dark cherry wood floors make this room feel both luxurious and comfortable. The dark cheery tones of the stairwell and sofa tables create a cohesive look that is perfect for nights spent entertaining friends or simply staying in. This room is a testament to the classics. White mouldings pop when paired with the rich dark brown hues of the walls. The room’s artwork, an oversize clock and framed black-and-white pictures, lend a subtle sophistication. 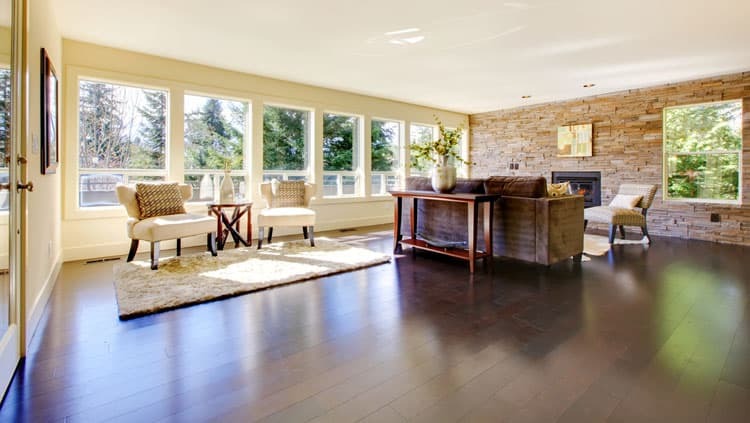 The true star of the room is the refinished hardwood floor, whose golden hues shine in the sunlight. This combination living room and kitchen truly lets the light shine in. 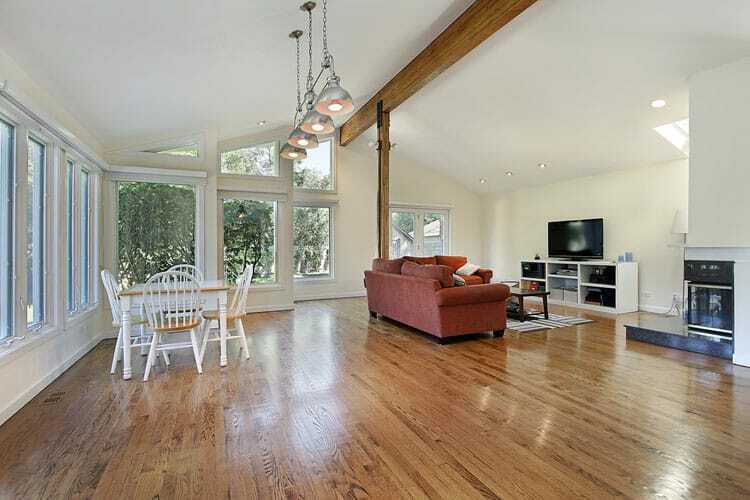 The ample natural light make the honey hues of the hardwood floor gleam. 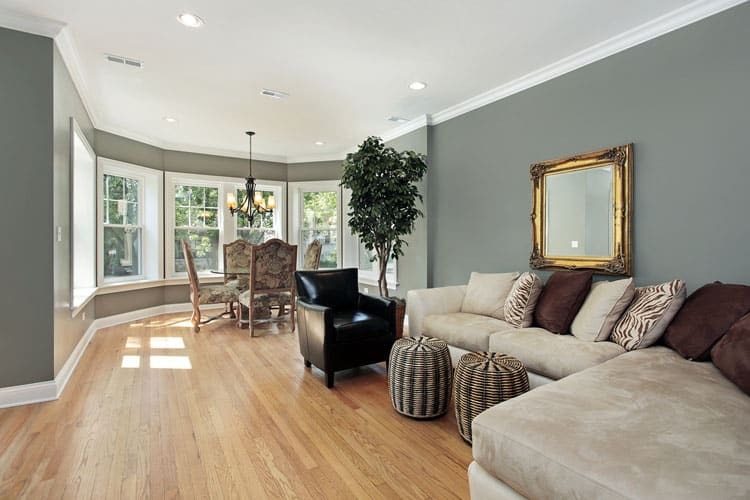 The dark grays found in both the kitchen and living room pair nicely with the creamy whites used throughout the space. The creams, blues and grays found in the living room rug tie the whole space together. Wow. With views like this, the television isn’t even needed. However, the television is perfectly accented by the paneled wall. 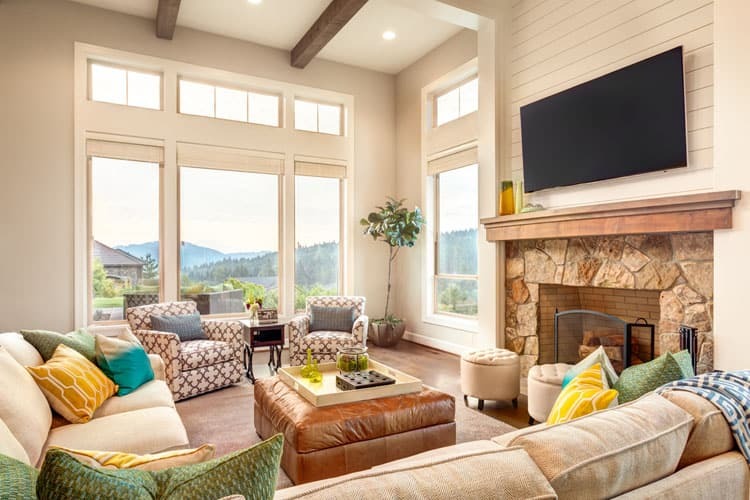 The use of hardwood may be limited to the floor, fireplace mantel and ceiling beams, but the hardwood still lends an undeniable warmth to the space. A comfy sectional sofa paired with patterned armchairs and tufted ottomans make this room the perfect place to watch the sun set behind the mountains.